I had the image of this cake in its completed state in my head for at least six months. When I’m dreaming up how I’d like a finished cake to turn out, I usually have a pretty good idea of how I hope it will look, but this cake was totally on point. It was everything I hoped for. The taste and texture is sort of like eating a snow-covered cloud. I know that sounds ridiculous, but please just try to picture that. Sounds awesome, huh? This finished cake was actually the fourth version I had made. Until now, I’d never made angel food cake before, and I found what I thought would be a good, solid recipe (Alton Brown, you disappoint me.). You know the definition of insanity, don’t you? Doing the same thing over and over again and expecting different results? Well, that was sort of like that first angel food cake recipe I tried. I attempted it three (!!!!) times, and each time was an utter disaster. I didn’t really read any other recipes before attempting that first one, and I thought that whipping the egg whites to only medium peaks would be fine. Little did I know that most other recipes call for stiff peaks, which would make a huge difference in the outcome of the cake. Not only were the whites not beaten sufficiently the first three times, but I mistakenly set my oven too cool. Oops. Also, every single time I inverted the pan to let the baked cake cool, it immediately fell out of the pan! The horror! It makes sense that it would do that if the whites weren’t fully whipped as they should have been. The medium peak whites were too fragile and did not provide enough structure to the baked cake, which made the cake collapse as soon as it was taken from the oven. I did a little Googling and found a great recipe for angel food cake from Joy Of Baking.com. It also had an accompanying video to go along with the recipe, and it allowed me to see just how the cake batter should look. Apparently the only thing I’d been doing wrong was under-beating the egg whites. So, with new egg whites freshly cracked and cake flour weighed out, I pressed on and created this amazing cake. There are no words for how thrilled I was when it didn’t fall out of the pan while cooling. I checked on it periodically for a whole hour while it was cooling, jumping-up-and-down excited that it was still in its pan. So, without further ado, here is without a doubt the most favorite thing I have ever made. I know I said that about the pumpkin lasagna and the cider donuts, but this is it. Lots of trial and error equaled a big learning experience for me, plus it’s totally Christmas-y. And just look at how cute those little decorations are! I have no words. Here’s the recipe. Please make it for Christmas, it would make the perfect centerpiece for your holiday dinner table! Okay! It’s angel food cake time. Preheat your oven to 350 degrees and have a clean, ungreased aluminum tube pan at the ready. Start out by making sure your egg whites are room temperature. I find that the easiest way to accomplish this is to soak the uncracked eggs in a large bowl full of hot water for 10-15 minutes. When time’s up, pull out the eggs and (with clean, grease-free hands) separate the whites into a super clean and grease free bowl (ceramic, metal or glass is great; plastic bowls tend to hold on to grease). Save the eggs for some other use. Take 3/4 c of your 1 1/2 cups of sugar and sift half of this sugar with your flour into a medium bowl. Set it aside and let’s get to whipping the egg whites! Pour your separated whites into the bowl of a stand mixer (also making sure the mixer and the whip attachment are spotlessly clean and grease-free) and whip them on speed 5 (if you’ve got a KitchenAid) for 1 minute. The whites should be foamy and bubbly but still runny. Add the cream of tartar, lemon juice and salt to the whites and beat it all on speed 5 for 2 minutes. At this point, the whites should be at the soft peak stage. They’ll have a little bit of volume and slightly mound up on themselves. Using a tablespoon measure, gradually add the remaining 3/4 cup of sugar to the egg whites. Turn the mixer on to speed 5, adding your 1 tablespoon of sugar at a time, waiting about 8 seconds between each addition. From start to finish, this process should take two minutes. Turn the mixer to speed 7-8 and whip for 4-5 minutes more. By this point, you should have a bowl of stiffly beaten but still shiny and glossy meringue! It’ll look a lot like shaving cream, and it shouldn’t look dry or clumpy. On speed 5, beat in your vanilla and almond extracts. It’s okay if they’re a little streaky because you can whisk it by hand with the whip attachment to make sure that the extracts are totally incorporated. From here, it’s easier to transfer the egg whites to a large, clean bowl to fold in the flour/sugar. Using a 1/4 cup measure, sift the flour/sugar on top of the meringue using a sifter or a fine mesh strainer. With a rubber spatula, carefully fold the flour/sugar into the meringue. Repeat with 1/4 cup at a time of your remaining flour/sugar until it’s all incorporated. This process took me about 7 separate additions. Using your spatula, carefully scoop/pour your cake batter into the waiting ungreased tube pan. Gently smooth the top so it’s flat, and run the blade of a large offset spatula through the batter to eliminate any air pockets lurking under the surface. Smooth once again if needed, and pop the pan into the oven. The cake will bake at 350 for 40-45 minutes (mine was ready in 42). The most important part of this baking process: No peeking! I hope you have an oven with a glass front door so that you can watch it bake without opening the oven door. The drastic change in temperature will cause your pretty cake to fall, and who wants that? When the cake is fully baked, it should spring back when you touch the surface, and it should be golden brown and cracked. It may settle a bit in the pan from its full height while baking, but don’t let that alarm you. As long as it doesn’t keep shrinking and settling, you’re fine. Remove the baked cake from the oven and invert the pan to let it cool. Some tube pans (like mine) are fitted with three evenly spaced feet on the top edge of the pan to allow the pan to rest on them while the cake is cooling. If yours doesn’t have these, prop up the center tube on top of a small glass or even the neck of a bottle. Let the cake sit upside down for a minimum of 1 1/2 hours, so that it’s fully cooled and in no danger of collapsing on itself. When the cake is fully cool, run a thin knife around the edge of the pan to loosen the cake, as well as around the center tube. Push the cake out of the pan with the tube portion still attached, and separate the cake from the bottom tube portion of the pan. Turn the cake over so that the browned side is facing down, and place it on a serving plate to await its frosting! It’s a good idea to place some parchment strips under the cake on top of your serving plate to as to keep the plate clean of frosting while you decorate it. While the cake cools, it’s frosting time! A side note: This frosting contains egg whites that are heated and beaten. The frosting is technically cooked, but if it creeps you out that the frosting has potentially unsafe egg whites (or especially if you’re pregnant or have a weakened immune system), feel free to use a different frosting recipe, or just some fresh whipped cream instead! In a medium to large metal bowl, place your two egg whites, along with the cold water, sugar, cream of tartar and pinch of salt. Using electric hand beaters, beat this mixture on low speed for 30 seconds just to get everything well mixed. Place a pot 1/3 full of water on the stove and allow it to come to a boil over high heat. Once the water is boiling, place the bowl on top of the pot with the heat still on high, and beat the mixture on high speed with the electric beaters while the mixture cooks. From when I put the bowl over the boiling water, until the frosting was finished, the whole process took 10 minutes. What you’re looking for is a stiff and glossy frosting. It’ll look sort of like whipped cream or marshmallow cream. You know the frosting is sufficiently beaten when it starts to clump around the beaters and pull away from the sides and bottom of the bowl. Turn off the heat and remove the bowl from the pot. Add the three extracts and beat on high to incorporate them. This frosting HAS to be used immediately. Working somewhat quickly (this frosting is prone to crusting over after a while), cover the sides and top of the cooled cake with the finished frosting, leaving decorative swoops and swirls to mimic snowdrifts. 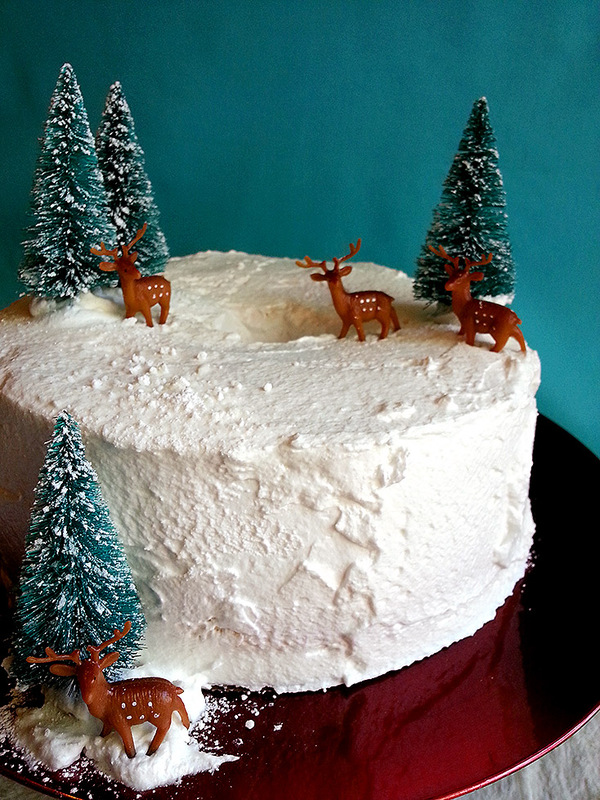 You can decorate this cake however you wish, but the ideal image I had in my head was to use little sisal trees and plastic deer. The perfect snowy, wintry scene. If you want to purchase similar trees and deer, I got mine from FactoryDirectCraft.com. When the frosting is all on the cake, carefully pull away the parchment strips and discard them. Fourth time’s a charm, I guess, cause this cake was a winner. It baked up tall and fluffy, the frosting came together without a hitch and the decorations couldn’t be cuter! It’s best served immediately after frosting, but it is more than tasty if you have to wait a day or two. Keep the cake at room temperature covered with a cake dome until you’re ready to serve it. It slices well with a sharp serrated cake knife. Use a sawing motion with little pressure applied, so as not to smash the fluffy cake. Perfectly light and fluffy angel food cake covered in billowy white frosting, it’s a Christmas time dream come true! It’s the closest thing I’ll get to a real white Christmas. Better enjoy it while it lasts! My angel food cake attempts have ALWAYS failed – when I think back it’s probably the egg whites being under-whipped. Oops! It’s very likely! I was so happy that this attempt actually worked! It’s a great recipe, give it a try :) Thanks for stopping by the blog, I hope you like what you see! Would this work in a mini-bundt pan instead? I think it should, so long as the bundt pan isn’t non-stick. The non-stick surface can make the cake fall out of the pan while it cools. You’d probably have to halve the cake recipe so that you wouldn’t have too much batter for your little pan. Good luck and let me know how it turns out!